Summary: Jaevid Broadfeather has grown up as a wartime refugee, hiding from the world because of his mixed racial heritage. He feels his future is hopeless, until a chance encounter with a wild dragon lands him in Blybrig Academy—a place usually forbidden to anyone but the rich and royal. But Jaevid’s case is special; no dragon has voluntarily chosen a rider in decades, so the proud riders of Blybrig must begrudgingly let him join their brotherhood despite his bloodline. Lieutenant Sile Derrick, a sternly tempered man with a mysterious past, becomes his instructor and immediately takes a peculiar interest in Jaevid’s future. Review: Nicole Conway is a great writer! 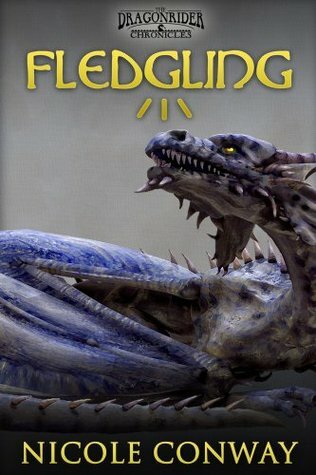 Fledgling is 100% story. I have to admit, the “hero’s journey” is my favorite type of story, so this was right up my alley. Conway has created an interesting world in which humans, grey elves, and dragons exist. Only, not in harmony. The main character is a half breed, hated by both humans and grey elves, finding no place he really belongs. Until one day, he accidentally talks a dragon into choosing him as a rider. Suddenly Jae is in the elite training academy for dragonriders and he must prove that he belongs there. This book touches on the subjects of faith in oneself, bullying, and discrimination. As a halfbreed, Jae is discriminated by both humans and grey elves. Niether knows that the other side hates him as much as they do. Jae goes through his life never fitting, never having friends, and never having a life to look forward to. He’s stereotyped by each side as well. Both think he’s a traitor and both think he’s sided with the other. In reality, he has no choice, because neither wants him. He is constantly bullied and name called by everyone, humans and grey elves alike. Jae must find the courage to have faith in himself and to choose where he wants to be in life. Only then with he ever find happiness or a reason to build a future life for himself. Recommendation: Fun and entertaining read!